In our Minute Movie Review, we let the readers know whether the film is worth watching in under 1 minute, check it out below! I’ll be honest, I did not give Shazam a chance prior to seeing it. If I were to base it off of the trailers, it didn’t blow me away and I was cautious of not liking the film because of it. Was it something with the mega buff silhouette of Zachary Levi? Maybe too much trying hard comedy? Not too “heroic” and “superhero” enough? Boy was I royally screwed over because after the 2 hours and change runtime of Shazam, I can say for certain that in my opinion this is THE BEST DCEU movie to date, trouncing even Aquaman and Wonder Woman. Ironic how the best DCEU film is “Captain Marvel”, ey? For the uninitiated, the TLDR of the story revolves around a kid who was chosen as the one “worthy” being to take on the mantle of Shazam. That kid is Billy Batson, a foster child who has been on the search for his real parents all his life. It is then through his search that he finds himself in a foster home, his newfound powers, and encounters an evil being in Thaddeus Sivana who wants nothing more than absolute power. It may not seem like it but Shazam, if anything, is an extremely charming movie that is backed by hilarious comedy, lovable characters, and a genuine heart for family and the relationships in between. What’s not to want? and the true hero inside of you, and the movie does that well enough to leave you rooting and cheering for Billy throughout. 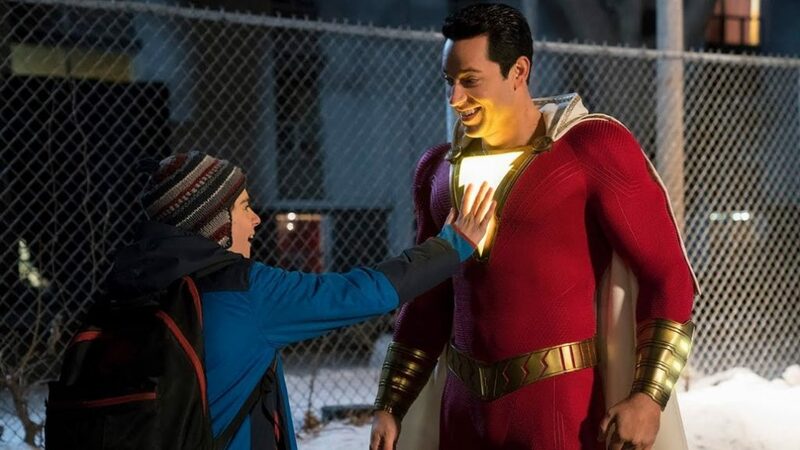 Zachary Levi is great as Shazam and he portrays the innocence of a kid trapped in his body quite well and although it is quite weird to seem him acting like a goofball in a sense, it never felt cringey nor awkward. It’s like during filming, the entire cast had so much fun crafting the film for the viewers and that really showed in the final product. For all of its praises, Shazam is very predictable (in a good, popcorn movie way), but I’m glad to say that there’s so much more to the movie that what the trailers show. The final face off with the big bad is awesome, and how the crisis is resolved is truly something that brought shivers to my spine and was worth all the build up until then. Fans of Shazam would know and anticipate the events to come but as someone who was not fully familiar with the lore, I can say for a fact the my mind was blown towards the latter part of the film. Overall, Shazam was such a joy to experience. Even with high expectations of the film, I feel that it wouldn’t disappoint and to be honest, the caliber here is what I probably would have expected from Captain Marvel. Again, Captain Marvel was not bad, it was just OK for me when I expected it to be awesome and this is exactly what Shazam was. The DCEU is alive and kicking, thanks to mister Sparklefingers over here, and it just proves that DC can actually give us a film that we’ve been expecting of them for quite a while now as it’s probably the most fun you’ll have leading into Endgame in a couple of weeks. It’s electrifyingly fantastic, feels genuine, and a very wholesome watch for the whole family! Do yourself a favor, book a ticket and enjoy this DC movie, it’s the best one yet. Oh, and stay tuned for 2 post credit scenes! Shazam opens in cinemas today, April 3, courtesy of Warner Bros.!